20% OFF for Audi quattro Winter Games NZ 2018 for Priority Discount for VIPs, Sponsors and Patrons. 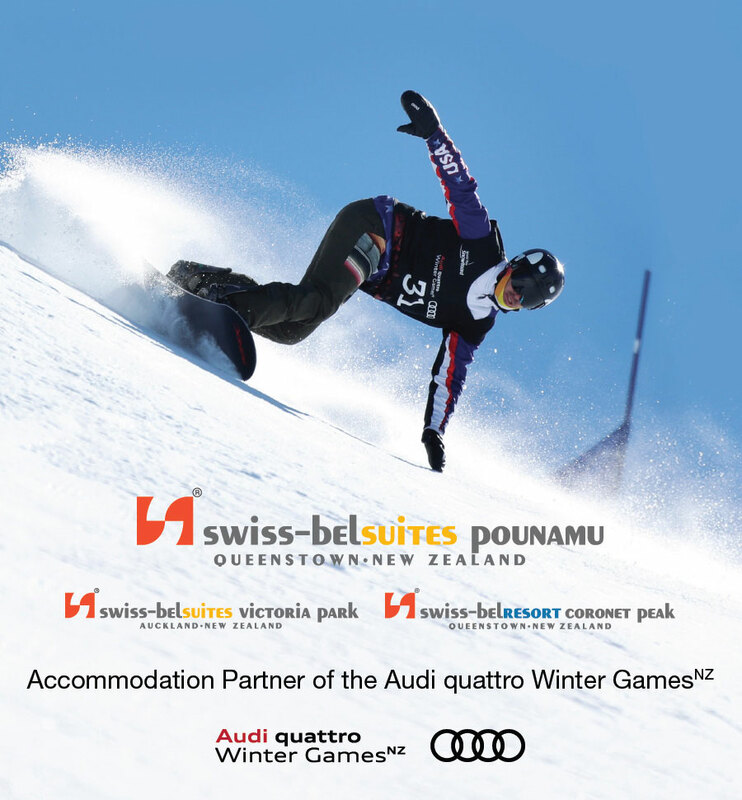 This August, Queenstown will play host to the sixth edition of the Audi quattro Winter Games NZ. Swiss-Belsuites are proud to announce our partnership with the event. Swiss-Belsuites would like to extend a special discount to Winter Games NZ patrons, sponsors and Games partners. To book your accommodation at our various locations please click on the following links. Swiss-Belsuites Pounamu Queenstown, is 5-Star Qualmark, includes 80 serviced suite apartment style rooms and a leisurely 10-minute walk from the centre of Queenstown. The spacious luxury suites ranging up to 104sqm offering spectacular uninterrupted views of Lake Wakatipu taking in the vista of Queenstown’s rugged Mountains. You also have the option to choose one of our Alpine Studios or combine the studio with a One Bedroom Suite and enjoy the luxury of a Two Bedroom Suite with stunning views. The Suites are tailored for your comfort offering warmth and privacy. Complimentary WIFI in suites, and free underground car parking with secure ski/golf storage lockers included. Explore and Experience its worthwhile. Swiss-Belsuites Victoria Park, is centrally located in the heart of Auckland just minutes from Sky City Tower, Viaduct Quarter, Auckland Art Gallery, and walking distance of award winning restaurants. The spacious 40 luxury guest suites, starting from 52 square metres are accentuated to create an honest style with a relaxed sense of living spaces providing a cosy and homely feel; the floor to ceiling windows, offering one of best views of Auckland Harbour Bridge, the city, and Victoria park, well sound-proofed from the city noise. The suites come with lounge, dining room and kitchen area, ready for business meetings or entire families. Offering privacy to both work and entertain. Discover and experience yourself in Auckland. Swiss-Belresort Coronet Peak is nestled in the lush mountains, just 10 minutes from Queenstown. Well known for its beautiful scenery and native birds that gives guests the ultimate back to nature experience. The resort offers a large, inviting restaurant opening up on an impressive courtyard, dining options also include the Bar with a lovely fireplace and onsite Bowling alley with arcade games and pool tables. Various attractions including ski fields, hot pools, golf courses and hiking and biking trains are located nearby. You can choose of a variety of 78 rooms – Standard, Twin, Triple as well as Family Guest Rooms. To explore Queenstown, just jump on the free shuttle into town.